This is a review of Sonoma wax melts from Kohl's for Spring 2018. The spring scents came out very early this year, in mid-December! 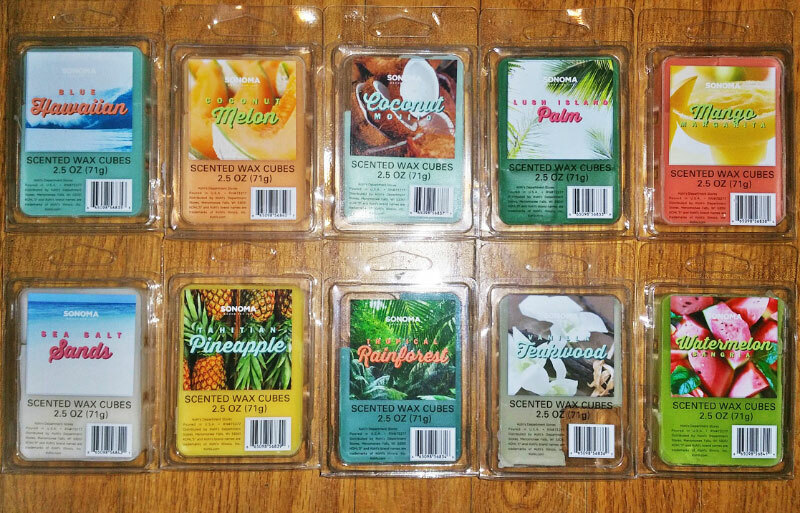 All of these scents use their soft, messy wax formula made by MVP Group Intl. This is a harsh tropical scent. I smell pineapple and coconut, and I think the harshness is black cherry. Looking at the scent notes, they're spot on. I would like this scent more if the cherry were not so intense; I don't mind harsh cherry scents, but mixed with the pineapple it's just too much. This is a nice slightly zesty tropical fruit scent that smells a bit like grapefruit but not bitter, and a little bit of coconut. I also smell the melon note. I like it because of the zestiness. This smells a little like the Sea Salt Sands scent. I smell lime but it's not as strong as the Sea Salt Sands lime. I also smell coconut. And also a little bit of a berry note. It's a nice rich clean scent with a hint of zestiness. Looking at the scent notes, I don't smell mint at all, and the strawberry is probably the fruit scent I smell, although I don't smell strawberry per se. I smell the palm (a slightly tropical woodsy note), a smidgen of coconut, and maybe a bit of zesty lemon (I think it's part of the palm note though). It's not a sweet scent at all, although I think there's a barely detectable smidgen of a cologne note, but I don't smell that cologne note at all when melted. It's a nice scent, but a bit too savory for me, a little like a pickled artichoke. A little sweetness or more lemon might help. This smells like orange, grapefruit, and a little bit of zesty lemon. It's a nice fresh thirst-quenching summer scent. I smell sweet lime and coconut, and a bit of a fresh note in the background. It's a nice, fresh, summery scent. It's pineapple. There might also be a hint of a tropical fruit in there with a very slight sour/bitter note, but not enough to be annoying. On cold sniff, this is a green woodsy scent with a slight palm note (palm is a woodsy, nutty, slightly waxy scent) and maybe a hint of coconut. There's also a smidgen of a sweet body wash type note way in the background (palm does sometimes have a soapy note). Melted, it's a fresh woodsy scent with a cologne note (but it's not overly sweet or cologney). Looking at the scent notes, I don't detect citrus. I really like this one. This has a light beachy sandalwood note with maybe a hint of coconut, a smidgen of vanilla, and maybe a tiny hint of a green note. It's not like ScentSationals Vanilla Woods, which I was kind of expecting based on the scent name. There's a very slight cologne note and a smidgen of smokiness perhaps, on cold sniff, but I don't smell either of those notes when melted. When melted, I also detect a bit of patchouli with that slight hint of a chocolate note. It's a nice scent. Looking at the notes, okay it actually IS chocolate, not patchouli (patchouli sometimes has a bit of a chocolate note). On cold sniff this is a nice sweet watermelon candy scent with a slight lime note. Looking at the scent notes, the lime I'm smelling is probably the lemon and raspberry. Now that I know it's raspberry, I think I do detect that. Melted, I just smell a fake watermelon scent. It's still a nice scent, but it smells better on cold sniff.